AC maintenance is the most cost-effective way to improve efficiency. 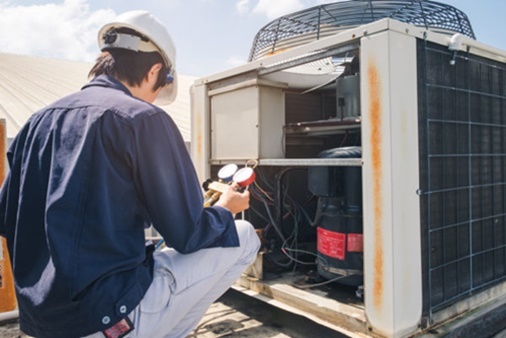 Regular AC maintenance will go a long way towards ensuring that the system delivers to its best ability and that your energy cost is as low as it can possibly be. If what the reports from the Department of Energy show are anything to go by, then cooling and heating bills can make even up to more than half of your total utility expenses. That, therefore, means that using central air conditioning forms part of the largest energy expense for any typical home in the United States. of your AC in your home. This will not only help you get the most out of the system, but it will also help control and reduce your expenses a great deal. Maintenance of the AC doesn’t have to be expensive and time-consuming. With the basic knowledge of what regular maintenance should involve, you will be able to achieve the full effect that comes with the regular and proper maintenance of the AC. Here are some of the main actions included in AC maintenance. 1. Cleaning and replacing the filters: One of the most important AC maintenance tasks is to regularly clean or replace the AC filters as doing this will ensure efficiency of the system. Clogged and dirty filters usually block normal airflow reducing the efficiency of the system significantly. If the normal airflow id obstructed or blocked, the air that usually bypasses the filter might curry dirt straight into the evaporating coil. This will impair the heat absorbing capacity of the coil. 2. Clean around your outdoor condenser unit: The outdoor unit, if sparkling clean and clear of any debris, will definitely work most efficiently. The buildup of dirt, dust and other foreign materials on your outdoor will negatively affect the performance and efficiency of your AC. Clean the condenser properly to ensure that it is free from dust, dirt or any debris. For a more in-depth cleaning, contact experience AC professional to get the work done effectively within no time. 3. Vacuum all the indoor vents and the vents unblocked: Regular AC maintenance should include vacuuming the indoor vents regularly and keeping them unblocked. You should vacuum dust, dirt and any debris away from the indoor supply vents. This will help maintain a steady airflow from the system. Again, keep toys, furniture, blinds and any other items of such kind away from blocking the indoor vents. 4. Increase the thermostat by just a few degrees: AC maintenance also includes adjusting the thermostat depending on the season. Typically, you should make an adjustment when summer hits, or when hits summer and so on. Typically, you should adjust the temperatures 5-8 degrees depending on the season. For instance, it should be lower during summer and higher during winter. This will help you save energy and money as well. 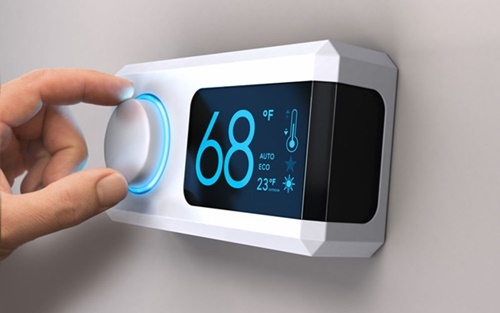 If you have a programmable thermostat, it will be much easier for you because you will be able to adjust the temperatures automatically for different times of the day, and during the times no one will be at home for many hours. 5. Keep any heat producing appliance away: Heat appliances such as lamps must be kept away from the thermostat. If you notice that your system is working hard and for a longer time, it may be because there is a heat producing appliance near it. With heat appliances near the thermostat, the appliances will be telling it that the air within the home should be cooled more, and this is what will make the system run harder and for longer times that it should. 6. Clear the drain line: A drain is located at the indoor cooling coil, and it is mounted just above the furnace at the basement. To keep the drain clean, simply flush a cup of chlorine bleach down the air conditioning drain and then rinse it using a gallon of fresh water. This is enough to keep the drain clean throughout the entire summer period. If you keep the drain line clean and clear, it will save the basement from taking on water when the drain becomes blocked. Your air conditioner might need more than the regular and easy maintenance. You will probably know this if the simple maintenance routines do not improve the functioning and efficiency of your system. In this case, you should hire a professional to conduct a thorough maintenance routine on your AC. Hiring experienced AC professional for thorough AC maintenance is one of the things that must be included in the maintenance. 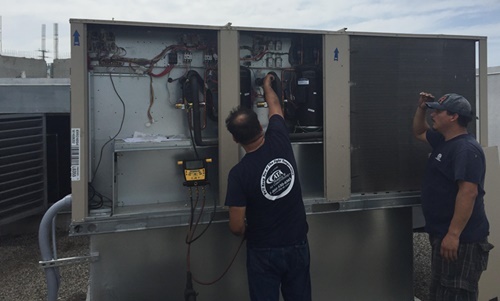 An AC’s fins, coils, and filters need regular maintenance for any unit to function normally, effectively and efficiently at all times throughout its duration of service. Without carrying out necessary maintenance, the performance of an air conditioner will decline with time and the energy use will steadily increase. Regular maintenance is the sure way to ensure your comfort and the efficiency of your AC.